Before:- Dr. Mukundakam Sharma and Anil R. Dave, JJ. Criminal Appeal No. 1683 of 2011. D/d. 30.8.2011. 2. This appeal is directed against the order dated 04.04.2011 passed by the Allahabad High Court. 3. The appellants being aggrieved by the aforesaid order had filed this appeal on which we issued notice. On service of the notice, the respondent has also entered appearance through counsel. 4. We have heard the counsel appearing for the parties. The appellants have now filed an affidavit which is on record tendering unqualified apology for the publication of article in question in Hindustan Times on 20.09.2010 out of which contempt proceedings arise. 5. The media, be it electronic or print media, is generally called the fourth pillar of democracy. The media, in all its forms, whether electronic or print, discharges a very onerous duty of keeping the people knowledgeable and informed. 6. The impact of media is far-reaching as it reaches not only the people physically but also influences them mentally. It creates opinions, broadcasts different points of view, brings to the fore wrongs and lapses of the Government and all other governing bodies and is an important tool in restraining corruption and other ill-effects of society. The media ensures that the individual actively participates in the decision-making process. The right to information is fundamental in encouraging the individual to be a part of the governing process. The enactment of the Right to Information Act is the most empowering step in this direction. The role of people in a democracy and that of active debate is essential for the functioning of a vibrant democracy. 7. With this immense power, comes the burden of responsibility. With the huge amount of information that they process, it is the responsibility of the media to ensure that they are not providing the public with information that is factually wrong, biased or simply unverified information. The right to freedom of speech is enshrined in Article 19(1)(a) of the Constitution. However, this right is restricted by Article 19(2) in the interest of the sovereignty and integrity of India, security of the State, public order, decency and morality and also Contempt of Courts Act and defamation. 8. The unbridled power of the media can become dangerous if check and balance is not inherent in it. The role of the media is to provide to the readers and the public in general with information and views tested and found as true and correct. This power must be carefully regulated and must reconcile with a person's fundamental right to privacy. Any wrong or biased information that is put forth can potentially damage the otherwise clean and good reputation of the person or institution against whom something adverse is reported. Pre-judging the issues and rushing to conclusions must be avoided. 9. This is exactly what has happened in the present case. 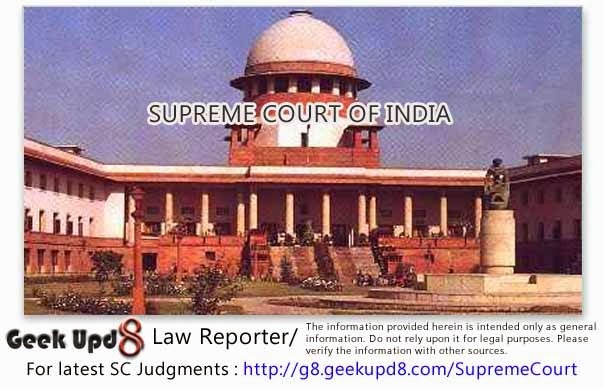 The then Chief Justice of the Allahabad High Court who has otherwise proved himself to be a competent and good Judge wherever he was posted during his career was brought under a cloud by the reporting which is the subject matter of this petition. His image was sought to be tarnished by a newspaper report which was apparently based on surmises and conjectures and not based on facts and figures. The dignity of the courts and the people's faith in administration must not be tarnished because of biased and unverified reporting. In order to avoid such biased reporting, one must be careful to verify the facts and do some research on the subject being reported before a publication is brought out. 10. We are glad that the persons against whom contempt proceedings were initiated for a wrong and incorrect reporting about the then Chief Justice as aforesaid have understood their mistake and have expressed their repentance through their advocate and also themselves by filing an unqualified apology before us for the wrong done. 11. On going through the impugned order also we find that apology tendered before the Allahabad High Court was not accepted only because it was felt that the same was not unqualified. Now, by filing an affidavit they have tendered unconditional apology. 12. The judiciary also must be magnanimous in accepting an apology when filed through an affidavit duly sworn, conveying remorse for such publication. This indicates that they have accepted their mistake and fault. This Court has also time and again reiterated that this Court is not hypersensitive in matter relating to Contempt of Courts Act and has always shown magnanimity in accepting the apology. Therefore, we accept the aforesaid unqualified apology submitted by them and drop the proceeding. 13. With the aforesaid observations, we order for closure of the proceedings initiated against the appellants herein under the Contempt of Courts Act by keeping the affidavit filed by the appellants on record with a direction to the appellants to publish the apology as stated in the affidavit in the first page of Lucknow edition of Hindustan Times to be published on 01.09.2011 and also at such other place, wherever there was any such publication, in a daily issue of the newspaper at some prominent place of the newspaper. 14. We appreciate the gesture of the counsel appearing for the parties and also for the fact they endorse the same view as expressed in this order. 15. The appeal is disposed of in terms of the aforesaid directions and observations.